Pig iron is an intrmediate product of a steel plant produced during smelting of iron ore in a blast furnace. Iron ore is reduced by coke using limestone and dolomite as flux for removal of impurities. The resulting liquid iron (hot metal), when cast in the pig casting machine, produces pig iron. Fig 1 shows pig iron. The term ‘pig iron’ has arisen from the old method of casting liquid iron from a blast furnace into moulds arranged in sand beds. The traditional shape of the molds used for these ingots was a branching structure formed in sand. It had many individual ingots at right angles to a central channel or runner. Such a configuration is similar in appearance to a litter of piglets suckling on a sow. Name of these ingots was given from the word “piglets”. When the metal had cooled and hardened, the smaller ingots (the pigs) were simply broken from the much thinner runner (the sow). Since pig iron was intended for remelting, the uneven size of the ingots and inclusion of small amounts of sand were insignificant when compared with its ease of casting and of handling. Presently most of the liquid iron is produced and consumed within integrated steel plants for steel making. In this context the term ‘pig iron’ is something of a misnomer within integrated steel plants since blast furnace iron (hot metal) is transferred directly to the steel melting shop in liquid form. The liquid iron from a blast furnace which is not sent for steel making is cast into pigs in pig casting machine for use in steel making later as cold charge or is sold to foundries or to mini steel plants having induction furnaces as merchant pig iron. Modern pig casting machines produce pigs having individual weight of 15 to 45 Kg. The merchant pig ironis the cold iron which is sold as ferrous feedstock for the steel and metal casting industries falls into the category of ferrous metallics. Other ferrous metallics are iron and steel scrap, direct reduced iron (DRI), hot briquetted iron (HBI) and various other alternative iron materials. There are some dedicated merchant plants whose entire production is sold to external customers. Basic grade – Basic pig iron has less than 1.0 percent silicon, under 1 percent manganese, and trace amounts of sulphur and phosphorous. This type of pig iron is mainly used for steel making. There are several grades specified in various standards based on silicon and manganese content of the pig iron. Foundry grade – This type of pig iron is being used in iron foundries and contains higher silicon. Various standards specify composition limits for silicon and manganese for different grades of this type of pig iron. Silicon content in foundry grade pig iron is much higher and usually between 1.5 and 3.5 percent. It can be as high as 4.25%. Pig iron is hard, wear resistant, fairly fusible and very brittle. It is not useful directly as a material except for limited applications. It has a low melting point (Around 1200 deg C) as compared to steel. Typically its hardness varies between 250 to 450 BHN, tensile strength between 50 to 25 kNs and % Elongation around 0% and 0.5%. The lower melting point of pig iron combined with higher density of the charge due to it, results into lower energy requirements and faster melting time when compared to that of an all steel charge make-up. Traditionally pig iron was worked into wrought iron in forging shops. Later this iron was used in puddling furnaces. In these processes, pig iron is melted and a strong current of air is directed over it while it is being stirred or agitated. This causes the dissolved impurities (such as silicon) to be thoroughly oxidized. An intermediate product of puddling is known as refined pig iron or refined iron. More recently pig iron is used in making steel in induction furnace and electric arc furnace. It also replaces scrap in BOF during the period of scrap shortage. 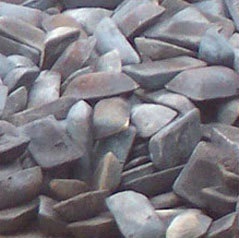 Pig iron can also be used to produce gray iron. This is achieved by remelting pig iron, often along with substantial quantities of steel and scrap iron, removing undesirable contaminants, adding alloys and adjusting the carbon content. Some pig iron grades are suitable for producing ductile iron. These are high purity pig irons and depending on the grade of ductile iron being produced these pig irons may be low in the elements silicon, manganese, sulfur and phosphorus. These types of pig irons are useful to dilute all elements in a ductile iron charge (except carbon) which may be harmful to the ductile iron process.